GlobalGiving has always required its partner organizations to send progress reports to their donors. And for good reason: sometimes these donors click the “give’ button when they read a compelling update. In fact, between 2007 and 2014, global givers gave $1,077,000 through progress reports. Because of my work on the GlobalGiving Storytelling project, I’ve been long interested in whether I could write a computer algorithm that would be able to tell the difference between a “good” story and a “poor” one. Last week I figured out how to detect a story’s point of view, and it appears to have a huge effect on whether people are inspired to give. These range from cool to warm, from personal to collective. But which of these is points of view is best if the goal is to get people to give again? I ran the “point of view” detector on all GlobalGiving progress reports to date and all of our East African community effort stories. For contrast, I included 812 examples of great storytelling from Cowbird.com, which has been emailing me a “story of the day” for the last two years. These Cowbird stories are manually curated, and thus they reflect what points of view people find most emotionally compelling. How common is each point of view? The fraction of reports with each perspective is shown in the box. Multiply by 100 to get percents. People who talked about community activities in our East African storytelling project tended to focus on “it” stories, mentioning “this organization” much more than any person, including themselves. Project leaders on GlobalGiving were even more likely to talk about themselves. 51% of Cowbird’s “story of the day” collection is told primarily from a first person perspective. Only 5% of all reports told their story using a “mixed” perspective. An example of a “mixed” perspective is where the organization reminds the reader who they are and why what they do matters, then shifts to letting a beneficiary tell his or her own story (an “I” story), then wraps up by acknowledging that donors helped make this happen (a “you” story). You should see the girl’s faces when they receive kits. I hope you can come someday. They are so grateful. The last time we were there a girl in Gulu, Uganda said when she was asked if her kit would really change anything, “I will no longer have to fear.” Thanks to you more girls will have more dignity, more safety, less distraction at school and yes, less fear. For that matter, without your support, she might not have been able to stay in class at all. It never ceases to amaze me that such a simple, direct solution improves so much for girls around the globe. Thank you for being an important part of the solution. Notes: N = 25,337 published reports. Data includes cases where nobody gave any money after reading reports (23% of the total). 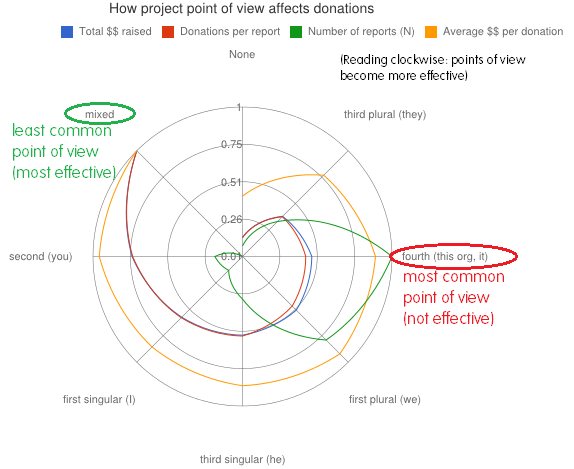 Project reports with a “mixed” perspective raise 111% more money and get 160% more donations than reports with “fourth” org-centric point of view. High GlobalGiving staff progress report ratings correlate with more money raised. What we consider a five-star report raises more than the four, which raises more than a three, etc. It’s the setup, not the ask: Most reports include an explicit plea for more funding, with words like give, support, giving, or donate. Including this “ask” in your report helps donations a little, but far less than including a story from the people you are trying to help. Donors can see the big shiny orange give button and know what to do without being told. Convinced yet? If so, then maybe you understand why GlobalGiving has been so effusive about organizations that listen to their communities and share this feedback through our story-centered-learning paradigm. The smartest way to fix your point of view is to talk to others and share their stories, instead of only writing from your perspective. Not only are reports with a “mixed” perspective better for the community (who have very few ways to speak to the people who influence money), they also are better for organizations (because GlobalGiving donors clearly appear to be listening). I created a simple demo tool. Paste your text into the box and it will analyze your point of view: djotjog.com/c/report/. This is just one more way that Globalgiving helps organizations listen, act, and learn more, faster. In fact we’re giving away money through our storytelling fund to encourage everyone to do this. Kaylan Christofferson, GlobalGiving’s Business Intelligence Analyst, joined us for the final session of the 2014 Online Fundraising Academy to talk about Fundraising Evaluation and Analysis. Kaylan and her team support GlobalGiving in financial goal setting and benchmarking and lead the charge in tracking annual progress and evaluating year-end results. She is responsible for compiling a weekly analysis of site activity and donations. She discussed the value of goal-setting and ongoing monitoring of fundraising activities and provided concrete tips to get started! WHO should be using data to drive fundraising strategy? If your organization has limited resources and if your organization is working for an important cause (which should be everyone! ), you should be looking at data. With limited resources, you need to use resources as efficiently as possible. WHY should we use data? When resources are limited, using your time efficiently and effectively is even more important! Example: Look at time spent on different fundraising activities to compare how effective each activity is. Can see that board outreach is more time-efficient. This is not saying that you should only focus on your most efficient activity, but this can help you be more efficient and help you stay on track with your fundraising goals. WHEN should you use data to set goals? How much money can your organization raise on Bonus Day? Search Design Experiment – Driving more donations to projects on GlobalGiving! At GlobalGiving, our goal is to help our partner organizations raise more money for their valuable work around the world. We’re always thinking of new ways to drive more individuals to the GlobalGiving site and to increase the number of people giving to projects. So, starting today, GlobalGiving is launching a new search design experiment in an effort to increase the percentage of donors who make a donation on the site! Throughout the next few months, when a donor goes to search for a project on GlobalGiving, they will be randomly assigned one of nine new designs (see below for more details about the designs). We will closely track and compare the results from each search design—what percentage of donors click through to see a project page? what percentage of donors choose to make a donation? do certain search designs result in more donations than others?—and continue to test all nine designs until we have statistically significant results and we are able to select the most effective search design! See below for more information about this experiment and screenshots of the different search designs. We are dedicated to testing and improving our website to offer donors the optimal giving experience so that over time, they come back, give again, and give more money or more often than before. One way that we are doing this is through experiments run in collaboration with major donors and researchers. Last year, GlobalGiving tested the default donation amount on project pages, finding that donors are likely to give a minimum donation of up to $30 when prompted (read more here). Earlier this year, we tested various matching offers to see what would encourage donors to go from making a one-time donation to a monthly recurring donation (see the results here). GlobalGiving’s newest experiment is inspired by the Money for Good initiative, which conducted research on the US market for charitable gifts from individuals, including the factors influencing individuals’ decisions to give. The report shows that most donors do not spend a lot of time researching organizations before making a donation and those that do are looking for simple, digestible information. Through this experiment, we expect to identify ways to increase giving through the search feature on our site by making it easier for donors to quickly compare projects and make a decision on which project to support. The new designs have two major themes: Consumer Report and Visual. The Consumer Report designs provide donors with more information about the project and the organization—Partner Rewards Level, long term impact, funding to date, reports over time, etc. The Visual designs use a tile-like layout to feature more projects on one page. These new designs will not affect the project itself. Donors with a direct link to the project or who are going to the project in response to a project report or thank you email will not see these new designs. This is the existing search design on GlobalGiving’s website. Select donors will see search results with the Partner Rewards Level of the organizations listed. Donors can click on the question mark to learn more about the Partner Rewards Program. Click here to read the description. Select donors will see search results with project grades. The grades—A,B,C—will correspond with the organization’s Partner Rewards Level—Superstars are A, Leaders are B , Partners are C. Donors can click on the question mark to learn more about grades. Click here to read the description. In this design, donors will see statistical information about project including funding to date, donation history, reports, and grade. In this option, we show donors more projects one on page—up to 200!—using a tile-like design. We will continue to test all nine designs until we have statistically significant results and we are able to select the most effective search design. Stay tuned for the results sometime next year! Over the last six weeks, GlobalGiving conducted an experiment on your project pages to learn more about donors’ giving behavior. In the past, the default giving option (the auto-selected button) was always the lowest option on the project page. These giving options are denominations you selected (and can change) when you created your project page. Hypothesis: If the default giving option was the largest listed amount less than or equal to $30*, then the average donation would increase.